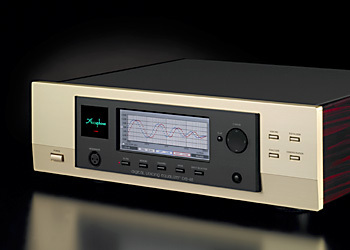 The DG-48 is a third-generation Digital Voicing Equalizer featuring extremely sophisticated digital signal processing technology developed by Accuphase. When wishing to reproduce superb program sources with optimum fidelity, the characteristics of the entire reproduction chain, including the speakers as well as the listening room itself, have to be taken into consideration, and the capability for providing adequate compensation is essential. The DG-48 meets this requirement with a two-fold approach, by enabling both sound field compensation (Voicing) and sound field creation (Equalizer). The newly added Simple Voicing course makes automatic sound field measurement and adjustment a breeze, while the Custom Voicing Course provides the user with extensive control over every aspect. A full complement of balanced and unbalanced analog inputs and outputs as well as digital inputs and outputs including HS-Link connectors ensure that the DG-48 will fit perfectly into any system configuration. The high-precision wide-format color display on the front panel makes using the supplied stylus pen a pure joy, enabling the user to create any desired response simply by drawing on the screen. Commanding this much power and flexibility has never been so easy.